Harold Wilson, the wily, cynical but effective Labour politician who won four elections and according to the Oxford Professor Danny Dorling helped to produce almost Nordic levels of equality in Britain by the time he stood down as Prime Minister in 1976 was famous for saying that “a week is a long time in politics”. The last seven day has been the longest week in Theresa May’s 25 months as Prime Minister. Her Foreign Secretary and Brexit Secretary, Boris Johnson and David Davis resigned along with other ministers and two Conservative Party vice-chairs. Johnson and Davis are now competing in the London press to denounce the woman who brought both men back from the political graveyard. The sight of two men beating up on a woman prime minister is not pretty. But such are the visceral passions on Brexit the conventional Tory rules on politeness and good manners go out the window. She published a White Paper on her ideas for Brexit. It was denounced by the Daily Mail as betraying the City as the 80 per cent of the UK economy which is services nowhere got a mention. Both pro and anti-Brexiters denounced it as turning Britain into a vassal state, kneeling to kiss the hands of Jean-Claude Juncker. President Trump turned up and told the Sun tabloid paper that Mrs May had made endless mistakes on Brexit because she would not listen to him. He added that he thought Boris Johnson would make a fine Prime Minister. All this as England exited from the World Cup losing to Croatia, the last nation to join the EU just as Britain is the first nation to leave. England were defeated by Belgium most of whose star players played in the English premier league thanks to EU rules on Freedom of Movement being upheld by the European Court of Justice in its 1995 Bosman ruling which stopped places in teams being reserved for national players. Mrs May, however, rejects the ECJ as an arbiter over such problems as allowing Europeans to work in the UK as soccer stars, bankers, or carers in old age homes. 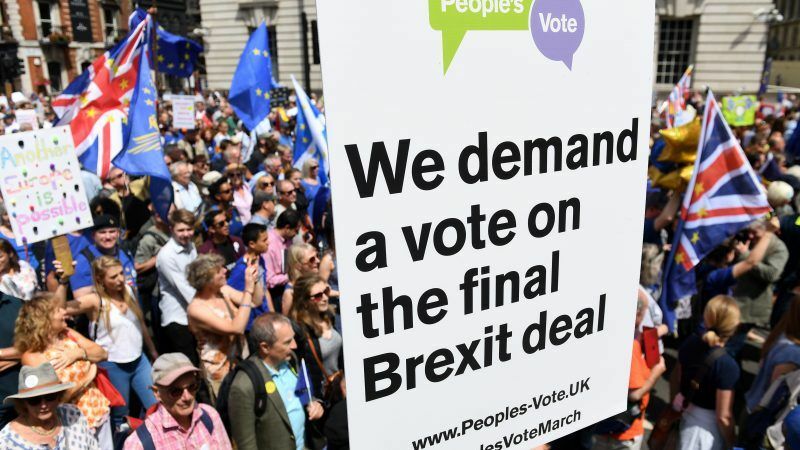 After the national pride of England getting to the World Cup semi-final and a longest period of sunny weather in England for many years, the country was taken over by anti-Trump demonstrations and a growing sense that Brexit had ended up in a policy blind-alley. Companies like Airbus, Jaguar Land Rover, Nissan and Unipart all announced they would have to move to the continent if Mrs May’s desire to leave the Customs Union and Single Market happened. The CEO of Lloyds of London, the world’s legendary insurance centre, told the BBC that with no access to the EU’s Single Market for financial services Lloyds would have to find a EU friendly capital to relocate to. The Government announced it was stock-piling food and medicines in case Britain crashed out of the EU. Both MEPs and all off-the-record briefings from Brussels and EU27 governments say that the demands in the UK’s White Paper are not acceptable. In a new axis of opposites, the very pro-business Labour grandee Peter Mandelson joined with the very leftist Labour leader, Jeremy Corbyn, to say all Labour MP should vote down Mrs May’s proposals. The prime minister faces votes today and tomorrow but win or lose there is no longer an obvious majority in the House of Commons for any kind of Brexit – hard, soft, No Deal, Mrs May’s Chequers paper or No Brexit at all. There will be a majority against almost any version of Brexit put to MPs. There is a growing sense that the only way to cut the Brexit Gordian knot would be to hold a second referendum possibly in conjunction with the EU agreeing to an extension of the Article 50 two-year exit period laid down in the Treaty. The June Council of Ministers accepted this possibility and more and more from across the political spectrum in the UK are calling for a rethink. The latest is Justine Greening, a former cabinet minister who is unknown in Europe but one of those hard-working efficient politicians who represent the middle ground in most political parties. Mrs May has an utterly divided party, a cabinet that is better known for its walk-out and attack on her than governing the nation, and a US President calling her incompetent to her face. Labour is only interested in using the Brexit crisis to topple the prime minister and offer no national leadership. Mrs May is thus slowly being forced into a corner from which a new consultation with the people may be the only escape. An alternative is for a major realignment of British party politics. But who realigns with whom? If Britain had a proportional election system or maybe elected a president this might be possible. Brexit is corroding the unwritten British constitution as it is eating into so much of today’s Britain. “We demand a vote on the final Brexit deal!” – Why not vote now, all over Europe: on http://www.our-new-europe.eu ! Poor May, a simple woman beaten up by two mechant guys.